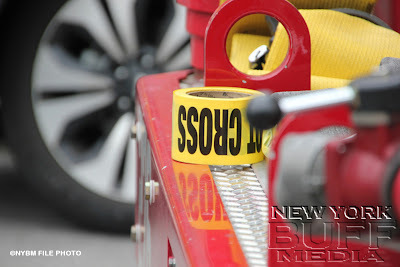 Bedford-Stuyvesant - A man was seriously injured after the vehicle he was driving collided with another one on Atlantic Avenue early Wednesday, FDNY officials said. The victim was hurt after the collision near Ralph Avenue just before 6 a.m., a fire spokesman said. The crash sent a 2-door Nissan sedan, which collided with an Envoy sport utility vehicle, into a retainer wall for the elevated tracks at the Long Island Rail Road's Atlantic Avenue Terminal. It was unclear which vehicle the victim was driving, officials said. The man, whom officials did not identify, wasn't breathing when emergency medical crews rushed him to Kings County Hospital Center, the spokesman said.